It is never advised to leave your batteries in a charger unsupervised, you should be able to check it every 30 minutes at least. When the charger shows the batteries to be fully charged you can remove them, leaving them in longer can cause over-charging which can result in battery failure and shorten it’s life cycle. Going over 4.5 volts could cause your battery to vent/explode. Later in this article I’ll write a list of some chargers that have overcharge safety built-in but I would still never suggest to leave them over night. Leaving a lion battery in a discharged state will result in a loss in capacity and a loss in cycles. Knowing the exact voltage is hard to measure unless you have a multimeter. When you use RDA’s or mechanical mods and build your own coils you should always have a good ohm reader. Again, I will put up a list of good ohm readers at the bottom of this article. Short-circuiting can cause your battery to explode! 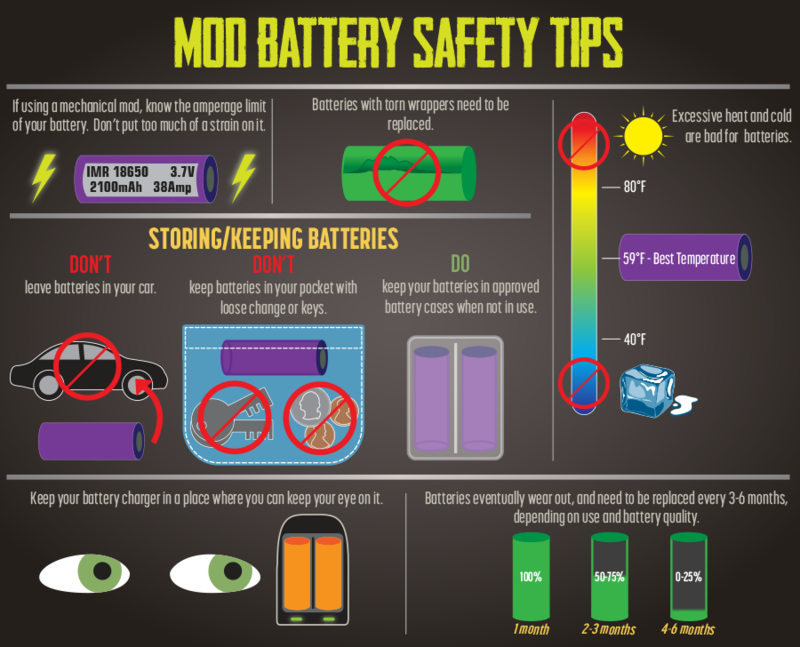 Which is caused when too big of a current is going through your battery which will cause you battery to burn out and you may risk injury to your face/hands. Short-circuiting a battery is very close to what a mechanical mod with a sub-ohm coil is doing, except you are trying to keep the resistance under the upper amp limit – there’s a fine line that you have to be careful of when sub-ohming. Never keep your batteries loose in your pocket! Especially not with keys or change! This can cause them to create a circuit and overheat and thus vent/explode. Also make sure that your battery wrap is not damaged and if it is re-wrap it! If you don’t know how to most of the vape shops will do it for you (maybe for a small charge). Battery wraps are cheap and may save your face/hands. Never leave your batteries in the sun or by a source of heat (cooker, heating and such). This will cause the battery to overheat and it will vent/explode. 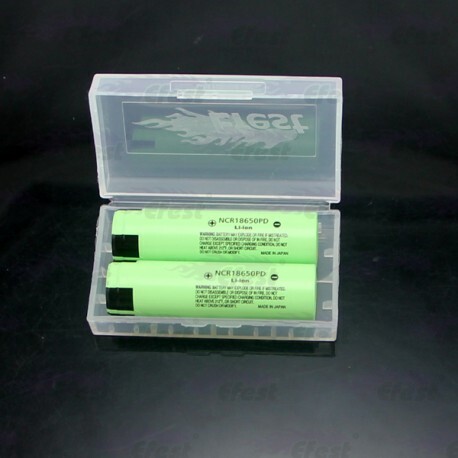 Don’t throw your batteries in the bin, instead bring them to your local vape shop/supermarket as they will have a recycling bin for old batteries. But remember if it’s just the wrap that is damaged you can always re-wrap it. Lithium-ion is safe but with millions of consumers using batteries, failures are bound to happen. In 2006, a one-in-200,000 breakdown triggered a recall of almost six million lithium-ion packs. Sony, the maker of the lithium-ion cells in question, points out that on rare occasion microscopic metal particles may come into contact with other parts of the battery cell, leading to a short circuit within the cell. Battery manufacturers strive to minimise the presence of metallic particles. The semiconductor industry has spent billions of dollars to find ways in reducing particles that reduce the yield in wafers. Advanced cleanrooms are Class 10 in which 10,000 particles larger than 0.1µm per cubic meter are present (ISO 4 under ISO 14644 and ISO 14698). In spite of this high cleanliness, particle defects still occur in semiconductor wafers. Class 10 reduces the particles count but does not fully eliminate them. Battery manufacturers may use less stringently controlled cleanrooms than the semiconductor industry. While a non-functioning semiconductor simply ends up in the garbage bin, a compromised Li-ion can make its way into the workforce undetected and deteriorate without knowing. Resulting failures are especially critical with the thinning of the separators to increase the specific energy. Cells with ultra-thin separators of 24µm or less (24-thousandth of an mm) are more susceptible to impurities than the older designs with lower Ah ratings. Whereas the 1,350mAh cell in the 18650 package could tolerate a nail penetration test, the high-density 3,400mAh can ignite when performing the same test. (See BU-306: What is the Function of the Separator?) New safety standards direct how batteries are used, and the UL1642 Underwriters Laboratories (UL) test no longer mandates nail penetration for safety acceptance of lithium-based batteries. Li-ion using conventional metal oxides is nearing its theoretical limit on specific energy. Rather than optimizing capacity, battery makers are improving manufacturing methods to enhance safety and increase calendar life. The real problem lies when on rare occasions an electrical short develops inside the cell. The external protection peripherals are ineffective to stop a thermal runaway once in progress. The batteries recalled in 2006 had passed the UL safety requirements — yet they failed under normal use with appropriate protection circuits. There are two basic types of battery failures. One occurs at a predictable interval-per-million and is connected with a design flaw involving the electrode, separator, electrolyte or processes. These defects often involve a recall to correct a discovered flaw. The more difficult failures are random events that do not point to a design flaw. It may be a stress event like charging at sub-freezing temperature, vibration, or a fluke incident that is comparable to being hit by a meteor. Let’s examine the inner workings of the cell more closely. A mild short will only cause elevated self-discharge and the heat buildup is minimal because the discharging power is very low. If enough microscopic metallic particles converge on one spot, a sizable current begins to flow between the electrodes of the cell, and the spot heats up and weakens. As a small water leak in a faulty hydro dam can develop into a torrent and take a structure down, so too can heat buildup damage the insulation layer in a cell and cause an electrical short. The temperature can quickly reach 500C (932F), at which point the cell catches fire or it explodes. This thermal runaway that occurs is known as “venting with flame.” “Rapid disassembly” is the preferred term by the battery industry. Uneven separators can also trigger cell failure. Poor conductivity due to dry areas increases the resistance, which can generate local heat spots that weaken the integrity of the separator. Heat is always an enemy of the battery. Most major Li-ion cell manufacturer x-ray every single cell as part of automated quality control. Software examines anomalies such as bent tabs or crushed jelly rolls. This is the reason why Li-ion batteries are so safe today, but such careful manufacturing practices may only be offered with recognised brands. The pressure or electrical force between two points. The longer the distance between the two points (i.e. the cable/wire length) the greater potential for voltage drop. The unit used to measure electrical current as it flows past a specified point. Always do your research on batteries when talking about vaping! Massive shout out to Mooch and The Vaping Bogan for all the help and additional feedback.